A proposed new extractive regime under the International Seabed Authority (ISA) would see the deep-sea subjected to exploitation by an industrial sector that has a poor track record on land. 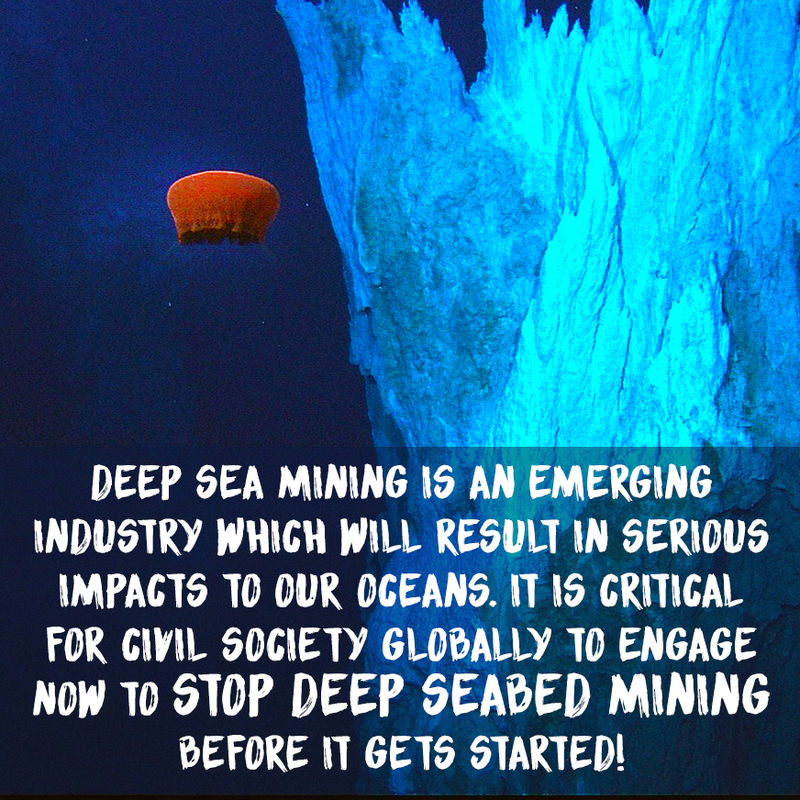 We invite you and/or your organisation to SIGN THE LETTER below calling on the International Seabed Authority and its Members to not proceed with deep-sea mining. Join our growing signatories including: Nnimmo Bassey, Director, HOMEF foundation and Alternative Nobel Prize recipient; Raj Patel Journalist, activist and New York Times best-selling author; Mark J. Spalding, President of The Ocean Foundation; and Dr. Catherine Coumans, MiningWatch Canada. The United Nations Convention on the Law of the Sea (UNCLOS) declares ocean resources beyond state jurisdiction to be the “common heritage of (human)kind”. In July 2018 the International Seabed Authority (ISA), the United Nations agency charged with stewardship of the deep seabed beyond state jurisdiction, will commence its 24th annual session at its headquarters in Kingston, Jamaica. At this meeting, member state signatories to UNCLOS will consider draft exploitation regulations for this area, bringing deep-sea mining of our common heritage closer to reality. Given United Nations and ISA guiding principles regarding equity and science-based environmental stewardship, we call for much broader public input into decisions affecting the deep seas, as the common heritage of humankind, before any extractive regime is agreed upon. Here we raise three fundamental concerns that must be addressed prior to contemplating an extractive regime: the need for public consultation inherent in the principle of common heritage; a thorough review of relevant existing concerns and negative impacts related to the mining sector; and the need for substantive and rigorous ecological risk assessment prior to decision-making. The common heritage of (human)kind is a significant equity principle in international law. This principle was formally applied to the deep seabed through a 1970 UN resolution declaring that the ocean floor in international waters – called the ‘Area’ in international law – be employed for peaceful purposes. In the early UNCLOS negotiations that led to the establishment of the ISA, the Global South sought to employ international institutions to ensure the equitable distribution of wealth generated through the deep-sea. However, the implementing agreement for the ISA that was eventually signed created the basis for a profit-driven regime governed by market principles. Over the past 15 years, with considerable involvement by mining and consulting firms and very little public scrutiny, the ISA has granted numerous exploration contracts in the Area to mining interests: state and private firms supported by member states of the ISA. As these exploration contracts come to an end, the ISA is considering implementing a regime to allow extraction. It is our view that this must not proceed without a more transparent and thorough global assessment of the ecological risks associated with deep-sea mining, as well as a more rigorous consideration of a benefit-sharing mechanism via which the common heritage principle will be upheld. The likelihood that mining of the Area will result in equitable wealth distribution to developing nations must be assessed against current realities in terrestrial mining. Tax holidays and avoidance structures are just some of the reasons developing countries see profits from their resources largely exported to the Global North and to tax havens. As the problem of equitable benefit distribution has not been addressed in terrestrial mining, why would we expect substantive economic equity from mining the ocean floor beyond state jurisdiction? Under a proposed new extractive regime, the deep-sea will be subject to exploitation by an industrial sector that has a poor track record with regard to environmental impacts on land. Given this, ISA’s moves towards permitting deep ocean mineral extraction warrant special consideration. The socio- environmental tragedies associated with terrestrial mining underline that any contemplation of extraction in the deep seabed requires the pre-existence of a mechanism for rigorous, independent environmental monitoring and enforcement. This would be essential to permitting extraction in a precautionary manner. The deep seabed’s spatial realities and unique common property status make it improbable that such a mechanism is attainable. Although the ocean has long been the ‘blank space on the map’ both scientifically and socially, we are increasingly aware of the vital role it plays in life on Earth. There is broad consensus in the scientific research community that our knowledge of the deep oceans is exceptionally rudimentary and our knowledge of the (potentially devastating) ecological reverberations of mineral extraction in the Area is in its infancy. We do know that the deep sea hosts unique communities of life that contribute greatly to the planet’s biodiversity. Renowned marine biologists, including Cindy Van Dover and colleagues, have recently pointed out that deep-sea mining would impact both the seabed and the water column, such that biodiversity loss would be both “unavoidable” and “likely to last forever on human timescales” (Van Dover et al., 2017: 464). Media coverage of the International Seabed Authority meeting and participant states commonly describe sea-bed mining as inevitable. Yet while private and state industry argues that deep-sea minerals will be required for new technologies, there is no demonstrably urgent need for these resources. Indeed, member states, including China, have made this point in the context of ISA Council meetings. Massive stockpiles of electronic waste already exist and, through new urban mining methodologies, could offer a more sustainable source of minerals. Moreover, a global public knowledge that deep sea extraction is under discussion is still extremely limited, as is public understanding of the implications of such a move. As deep sea mining would impact the common heritage of (human)kind in ways that are not yet scientifically well-understood, time should be taken to initiate a wider public discussion and to carry out additional scientific research. We urge the members of the International Seabed Authority to rethink its mandate for the Area and its common heritage. To curtail a precautionary approach under pressure from industrial interests, whether state or private, poses a major threat to future generations. We urge the international representatives at ongoing ISA meetings not to succumb to that pressure. 1. Formal, broad public consultation on questions of ‘common heritage’ and international equity as it pertains to the deep sea. 2. Greater substantive research on deep sea ecology to fill fundamental gaps in knowledge of this eco-system and its relationship to adjacent marine habitats. 3. Greater detailing of relevant impacts and risks arising from deep sea mining, including through an assessment of ‘ecosystem services’ that would be disturbed, and an evaluation of the mining industry’s record, both ecologically and in terms of financial returns to states, in various jurisdictions on land. This is not the time to move forward with an extractive regime; there are far too many uncertainties. International leadership at the ISA is required to prevent recklessly proceeding with deep-sea mining. Van Dover, C. L., Ardron, J. A., Escobar, E., Gianni, M., Gjerde, K. M., Jaeckel, A. Jones, O.B., Levin, L.A., Niner, H.J., Pendleton, L., Smith, C. R., Thiele, T., Turner, P.J., Watling, L., and Weaver, P.P.E. (2017). Biodiversity loss from deep-sea mining. Nature Geoscience, 10(7), 464-465. A Joint Sign-on Letter to the International Seabed Authority calling for moratorium on deep sea mining before irreparable damage is done the world’s oceans. A joint statement to the International Seabed Authority from 45 organisations warning of significant loss of biodiversity if the world’s seabeds are opened up to mining. The European Parliament adopted a resolution calling the Commission and EU Member States to support a moratorium on commercial seabed mining exploitation licenses. Read paper by Julie Hunter, Pradeep Singh, & Julian Aguon. A range of resources and publications on deep sea mining. Reports from the Deep Sea Mining campaign and other organisations on environmental, social, economic and legal concerns about deep sea mining. 1 Signatories Already. Be one of them!